Irons come in all shapes and sizes these days so it can be difficult to figure out what sticks you need to hit more green-seeking shots. Callaway alone has seven different irons in their RAZR series, each aimed at golfers’ different skill levels and budgets. 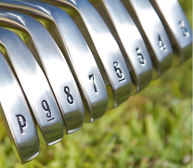 Generally, though, you’ll find most irons in a “game improvement” or “player’s” category. The former is likely to have a wider sole, thicker topline, and a deeper cavity in the back – all features that improve overall forgiveness. Players’ irons, on the other hand, feature smaller heads that are thinner overall and have less of a cavity, if at all. This allows a player to more easily work the ball right and left and flight it higher or lower based on the conditions, lie, and other factors. Clubs that are forged, rather than cast, are softer to provide a higher degree of feel and have traditionally been found primarily in players’ irons – although that has been changing a bit as more advanced manufacturing processes have evolved. Speaking of Callaway RAZR irons, their new RAZR XF set is a premium set of game improvement irons that carry a premium price. They feature a two-piece construction, making them very hybrid-like with a forged body and a carpenter steel face. Callaway claims they have the highest MOI (moment of inertia, which is one measure of forgiveness) of any iron they have ever produced. The rest of their game improvement style irons include the RAZR X HL which are designed with a lot of clubhead weighting moved low and toward the heel. They come at a lighter price point but provide a lot of forgiveness, so if the RAZR XF is out of your league, your next best option would be the RAZR X HL. Their next sets of game improvement irons are the RAZR X and RAZR X Black. These irons are similar in terms of forgiveness and construction with the RAZR X Black sporting a cool blackened finish and slightly stronger lofts for a little more distance. The RAZR X Tour is a nice step up in playability and is technically considered a players’ iron, but with a lot of the features that make their more forgiving irons as easy to hit. The styling and look instill confidence while providing plenty of help to mid- and low-handicappers. 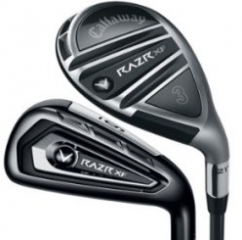 Skilled golfers will likely gravitate more towards the RAZR X Forged or the RAZR X Muscleback. The X Forged is a cool looking club forged from soft 1020 carbon steel that still feature a cavity back and perimeter weighting, but with a small, thin construction that plays well from any lie or turf condition The Muscleback iron is truly meant for highly skilled players. It has no cavity back and minimal offset. If you don’t ALWAYS strike the ball in the center of the clubface, then these aren’t for you. The Cobra AMP and AMP Forged are two new irons that feature what most folks call “Rickie Fowler Orange” (or OklahomaState orange, to be respectful of his college golf days). AMP stands for Advanced Material Placement, which means they strategically use different materials to promote ball speed and forgiveness. In the Cobra AMP, this means a strong steel face that can be thinner to provide more distance. This face is then plasma welded to a softer stainless steel body constructed with perimeter weighting and other forgiveness-enhancing features. 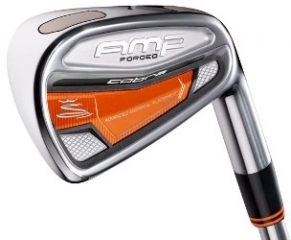 The AMP Forged is a one-piece steel forged clubhead with tungsten toe and heel inserts. It has a progressively sized pocket in the back cavity of the club to improve forgiveness in the mid to long-irons. The pocket is filled with urethane which improves the sound at impact while, along with the soft forged steel of the clubhead, provides exceptional feel. 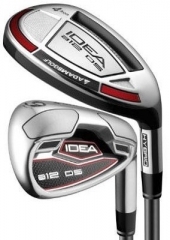 Adams a12 OS and Pro a12 irons are another pair of game improvement and players’ irons that have great features for golfers of varying skills. The a12 OS (OS stands for Over-Size) are reputed to provide even more forgiveness than their predecessor, the a7 OS, which was a very popular set among maximum game improvement sets of irons. The integrated set provides three short cavity-back irons, two hybrid-like mid-irons they call trans-hybrids, and three hybrids for long irons. This allows them to provide all the forgiving features of hybrids where most golfers need it, and to gradually transition into the short clubs. The hybrids in the set also featureAdams “velocity slot technology” – thin channels that run along the sole and the crown just behind the face – as seen in their fairway woods and drivers. The Pro a12 are a more traditional cavity-back iron classified as a players’ club. They are forged from soft 8620 steel for a great feel, and are triple milled (face, grooves, and cavity) for precision manufacturing. TaylorMade RocketBallz is quickly becoming a highly recognized buzz term around golf, and their irons are another part of that line, along with the woods and driver. RocketBallz irons feature a very thin face that reaches the limits of conformation for ball speed (measured as COR, coefficient of restitution). The long irons are a two-piece steel construction that carries their wood-design forward into an iron. They feature a cool darkened finish with very subtle lime green highlights along the back of the club. The RocketBallz Max irons incorporate a tungsten sole weight and a draw bias to provide maximum forgiveness in a game improvement iron loaded with features. They also have light weight construction throughout to help further improve swing speed and the typical shaft set up puts graphite in the longer irons and steel in the shorter irons. 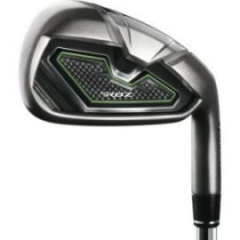 With this configuration, the RocketBallz Max irons are not inexpensive, but worth a look if you want the most help you can get in an iron set at any cost. 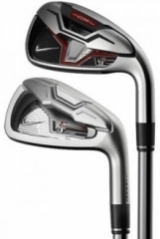 The Nike VR_S and VR_S Forged are another one-two punch covering both the game improvement and players’ categories of irons. The Vr_S features many of the same technology seen in other clubs in this category, but with additional consideration given to certain points on the face where their extensive research has indicated that higher handicap golfers tend to hit the ball. We all know high handicappers don’t always hit the center of the clubface, but we don’t likely know where they tend to hit if they don’t find the sweet spot. With that information, Nike expanded the sweet spot through the lower part of the clubface to put the most forgiveness where golfers need it. The Vr_S Forged uses a unique material identified as a nickel-chromium-molybdenum alloy steel that allows Nike to create an incredibly thin face in a forged iron. That thin face promotes ball speed meaning longer shots in a great feeling club. That, coupled with the X3X grooves that innovatively meet conformity while providing exceptional spin, create a great players iron with tons of features. Whatever kind of golfer you are, whether you need game improvement or consider yourself a player, check out the new irons and get the inspiration and confidence to shoot at more flags, hit more greens, and have a lot more fun this year. About the Author: Tim Carrigan is a member of the Golf Writers Association of America and has been writing about golf equipment, destinations, and other features for more than 5 years. He first began playing golf at the age of seven and has been an avid golfer ever since. Mr. Carrigan is a founder of KC Golfer Magazine.